Will investigate in my next playthrough. Tell you one thing, it doesn't do anything for Voltage gain. Is Yukiho/Mami/Yayoi still the sinking fleet/worst possible team stat-wise in the game? I got up to Week 6 and failed horribly at the Promotion, THE DEBUT, because I didn't understand the whole button pressing at first. But now I understand it better so I can do better on my next Promotion. But somehow when I turned off the game and re-loaded it, it brings me back to Week 4. So that means I can redo THE DEBUT again. =D Hm, I have to figure out how to properly save my game. Sadly, yes and Yayoi's and Yukiho's bursts aren't exactly top tier either. Mami has the 2nd best dance burst but it doesn't help with her stats. The new invincible armada would consist of Chihaya as leader because of her excellent compatibility with other idols, her absurd total base stats of 71 and her excellent 6/2/2 vocal burst. One could also use her as a member cause that compatibility is great too. - Miki for her 2nd best base stats of 63 and decent 5/3/2 visual burst, has decent compatibility as leader or as a member. - Hibiki has a tied 3rd place with Makoto for highest base stats, both having 62, and has a good compatibility as either leader or a member and has an excellent 6/2/2 dance burst. 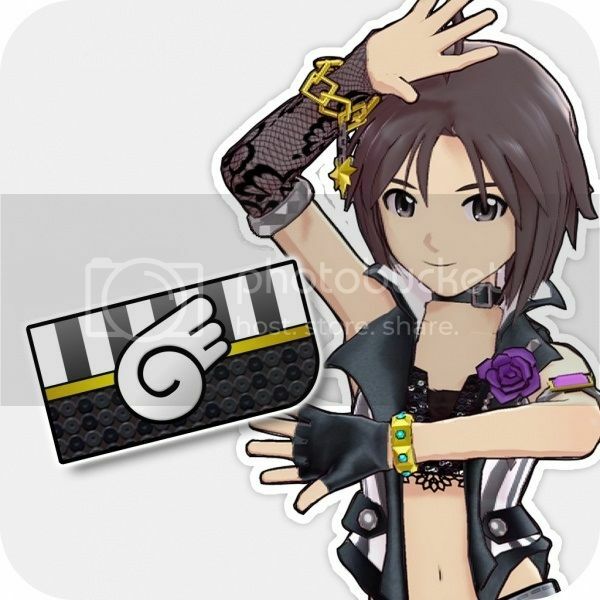 - Makoto has good stats and her compatibility with other idols is better than Hibiki's but her 4/3/3 dance burst severely lacks in scoring potential. By going with Chihaya/Miki/Hibiki one has the best multi purpose team in the game and doing story mode with any leader, Chihaya and Hibiki and by going with either the Da/Vi route or Da/Vo route one should theoretically net the best results. I should add that compatibility is a neglectable variable and shouldn't really be taken in account in building units seeing as how it barely has any influence on the game. The reason why Hibiki is a better choice than Miki is because there's only a 1 point difference on total stats between the 2 and because the difference in burst potential will influence once's score by a fair degree. Because of her base stats of 71 Chihaya should technically always be a member of any unit, regardless of the chosen strategy. Isn't autosave on by default? If it isn't, then...I do believe you just click "yes" / はい in the window that pops up after the end of each week. couldn't they have boosted her base stat to 72? I didn't know certain idols had good/bad compatibility? Which idols don't get along well with others? Isn't autosave on by default? - Favorable = Haruka, Hibiki, Makoto, Miki, Takane, and Yayoi. - Doubtful = Mami and Yukiho. - Favorable = Chihaya, Hibiki, Makoto, Mami, Miki, Yayoi, and Yukiho. - Favorable = Chihaya, Makoto, Mami, Takane, Yayoi, and Yukiho. - Favorable = Chihaya, Haruka, Mami, Miki, Yayoi, and Yukiho. - Generic = Hibiki and Takane. - Favorable = Haruka, Yayoi, and Yukiho. - Doubtful = Chihaya, Hibiki, Miki, and Takane. - Favorable = Chihaya, Haruka, Mami, and Yukiho. - No reaction = Takane and Yayoi. - Generic = Hibiki, Makoto, Miki, and Yukiho. - Favorable = Chihaya, Haruka, Makoto, Mami, Miki, Takane, and Yukiho. - Favorable = Haruka, Makoto, Takane, and Yayoi. - Generic = Chihaya, Hibiki, and Miki. Would this be considered as a compatibility listing? Also a quick fyi, bursts are stronger near the end of the game, and is strongest when the glowing outline exceeds the black line, because it's dependent on the size of the danketsu circle and seeing as how it grows by an unknown value every week..
Yeah, there's no tension to manage this time, so before where there were high stats/low character, and you had to get Goods on those characters to break even on Tension, now you just have high stats. Oh, and easy lessons. Oh, game balance. You were so cool. Does anyone know if this compatibility thing is good for anything? Cos it seems like you can just randomly pick any three idols (and I pick them entirely based on stats and bursts) and manage the unit's moods just fine. I'm guessing this compatibility thing come into play when you switch leaders? I'm sorry for asking about this again. -_- I've unlocked one of the special Feses, and I cannot pass it, no matter what I do. I've tried using both Sugamo-chan and Watanappe the 10th. Neither seems to help at all. Even when the rivals don't spam memories, they raise Voltage about twice as quickly as my unit, and when they do Burst Appeals (which they get about three of every Fes!) they get about 10,000 points instantly. I'm seriously starting to wonder if this is even possible. I'm Image Level 13, by the way. Have a decent highscore and let your unit handle it. Don't you need to be on second playthrough for that?